Well over 220m GP when at full strength. 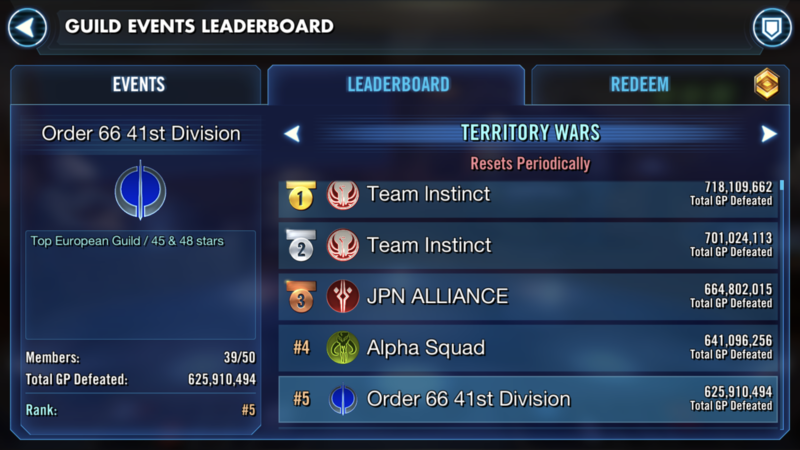 Order 66 41st Division looking for highly competitive players who are focused on crushing TW opponents. 45 stars ls tb. 48 stars ds tb. Seeking players with at least 4.1m GP and willing to work on TW squads and toons. Lower GP accepted if you have all TW required toons and factions. All raids on farm since the very beginning. Winning TW record. Can compete with the best guilds in the game. We will help you crush your Grand Arena opponents! Creative solutions to get more guild members top ten Sith Raid rewards. International membership with EU and Americas friendly raid times. Weekday raids are at 4pm EST / 9pm BST. Weekend Sith is 10am EST / 3pm BST. 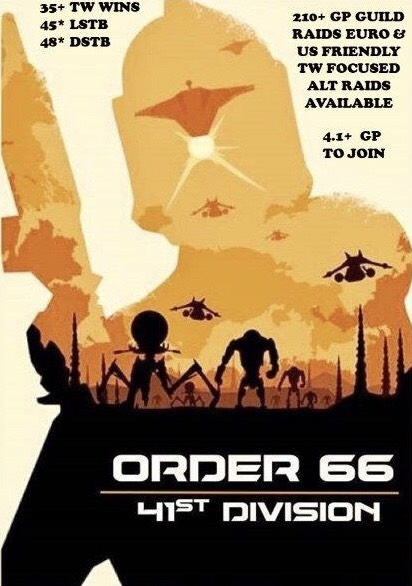 Part of a 4 guild alliance, Order 66. All guilds are competitive with experienced and veteran players. We use Line app for communication, but have a discord server available for bot spamming. Currently able to accept a small group of committed players. 2 openings, bring your buddy! Get in before LSTB begins! 2 spots open! yes, @Gavin80 we still have a spot open. Sent you a pm. Send me a pm if you want to join after LSTB ends today. Room for 2 TW focused players. Still looking. Reach out before TW starts. Hit me up before TW begins. Still looking for 2 players. Need to be focused for TW. Several openings available, contact for more info. We still have room for 2-3 people. Get in now before TW and dstb! Couple hours before TW starts! Or reach out to join before TB and get 48* with us! Looking for 2 before TB begins. Reach out!